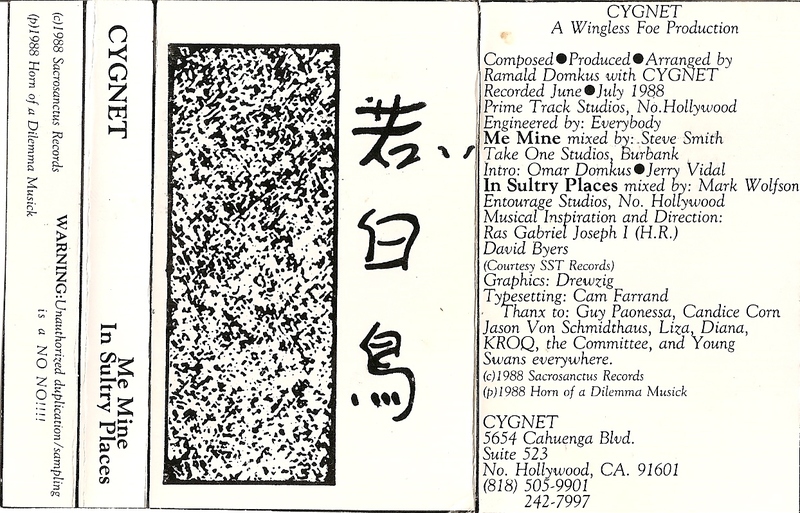 Cygnet is a band that my brother, Allan, had from about 1986-89 and I was the bassist. It is the first band that I played fretless bass exclusively in. I would say that as a band we were not part of what was going on in the L.A. club scene at the time. It was the era of the glam rock band and the dreaded “pay to play”. Any gig’s that we had consisted of three hair bands doing the same music and then us, a creative, artsy, and ethereal band followed by another big hair band clone. As a group we were along the darker alternative music scene ala Bowie or Bauhaus. I had a wide space to play my bass lines and the music was fun to play. 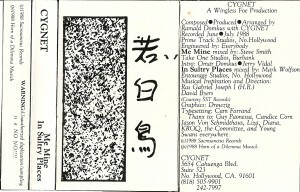 We released a two song cassette and a 7” single both titled Cygnet in 1988. As I had mentioned in my H.R. link, Allan had already established his friendship with Joseph, and that is reflected in the credits. Click on the picture for a larger view and you will see H.R. and David Beyers mentioned. I doubt you will ever find either one of those, but if you are able to find and purchase my brother’s CD called “Shadows” that he did with his band, Spy Glass Blue, you will hear a lot of the songs we used to play. I, however, am not the bassist on that recording.